If you are considering a Lawn Restoration Package keep in mind that it will only deliver great results if you water your lawn, often. The key is light frequent watering, not long periodic watering, nor long frequent watering. It will be a lot easier if you have sprinklers on a timer system, but it is not necessary. I recommend watering 2 to 3 times a day (depending on the weather) for about 4 to 5 minutes in each area of your lawn. This watering schedule needs to be maintained for about two months if the over-seeding was done in the spring, or for about a month and a half if the over-seeding was done in the fall. This package will give your lawn a good start to becoming the lawn you’ve always wanted; thick, lush and a nice deep green colour. Aeration is a very important practice for your lawn. Aeration is the process of pulling soil cores out of the ground. It allows more air, water, and nutrients into the root zone of lawns. Weed Pro recommends aerating once or twice a year. In the spring and fall during the two most crucial times for root development. Remember, healthy roots will determine the overall health of your entire lawn. Overseeding is done with our slice seeding machine. This machine plants rows of grass every 1.5″ directly into the soil. The direct soil contact increases germination rate and grass plant establishment by as much as 90% compared to broadcasting. The seeds we choose are custom blended specifically for Weed Pro. We have chosen our varieties because of their dark green colour, nice texture, disease resistance and their ability to quickly establish itself through aggressive rhizome development. The grass seed Weed Pro uses are top performing varieties, not what you find at your typical garden centers. Top Dressing with our 100% organic alfalfa pellets. There are numerous benefits to this product, but what we really like about the alfalfa is it’s ability to retain water. Keeping a lawn moist while it is germinating and establishing itself is absolutely vital to the survival and success of over-seeding a lawn. If a newly sprouted grass seed dries out, it dies, period. Alfalfa pellets will retain as much as 4 times its weight in water. An average sized lawn receives 100 lbs of topdressing which equates into 400 pounds of water retention at the surface of your lawn! It helps a lot. Finally about three weeks after we over-seed your lawn we will return to inspect the condition of the new grass. By this time you will have likely mowed your lawn once and the new grass plants will be two to three inches tall. This is when we like to give them a help in the form of Liquid Kelp. Our liquid kelp is full of vitamins and minerals which your baby grass will love. 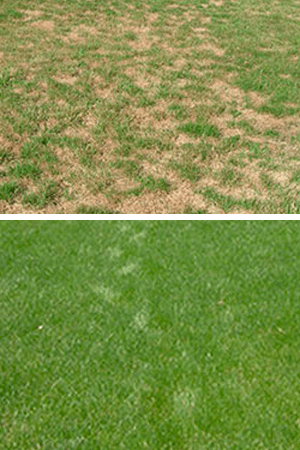 Furthermore it is help you lawn absorb more nutrients out of your existing soil. Another great benefit of kelp is it helps your lawn cope with stress, the heat stresses of summer and the cold stresses of winter.